The 15aug02 issue reruns an article about making your own oars. The 1sep02 issue will be about boat camping. Pierre-Yves Gabi cartops his AF3 in Switzerland! 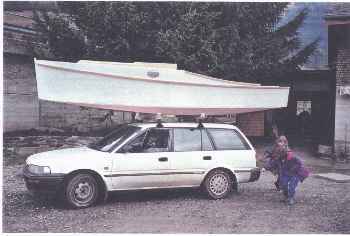 Twang is a small light power skiff, light enough to cartop if you keep your mind on weight as you build and if you can figure out a way to carry your motor and fuel in your car. It would also suit well the needs of someone who wants to carry his boat in the back of a pickup truck. She is 13' long, 4' wide, and I'm thinking about 100 pounds stripped. I've never seen a hull shaped like this before. Look closely at the lines and see that the bottom is dead flat lengthwise for the last 10', and also flat across for the last 7'. 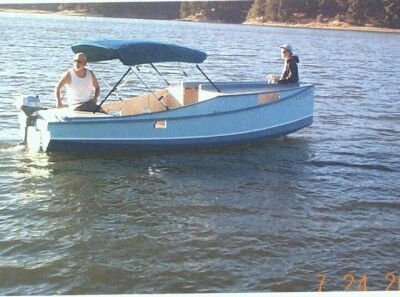 That gives the boat good capacity and I'm thinking the ability to plane with a small motor, say 5 hp with a light skipper. So that much is about the same as with my little JonJr. design. But the bow here is pointed and designed to meet a wave with a deep V shape and hopefully be softer riding than a jonboat or flat iron skiff. There is bound to be turbulence where the deep V meets the flat bottom but I'm hoping it won't be a factor on plane since only the aft half of the hull will be in the water then. I could be wrong and we might find out why I've never seen a hull like this. I'm quite certain it is impossible to come up with a new idea about hull shaping because everything has been tried in the past by good people. But new materials and techniques come along so that ideas that didn't work a generation ago might now be valid. 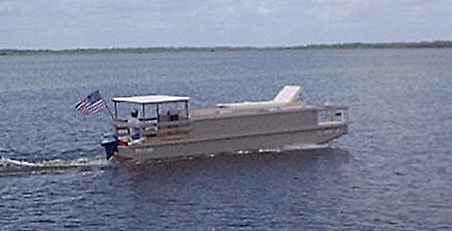 The hull is made with four sheets of 1/4" plywood and I think it will be easily made. The sides and bottom will be a piece of cake. 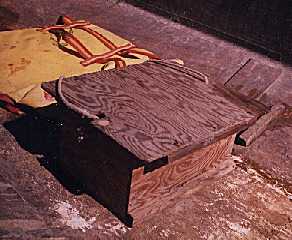 The deep V bow is made from two simple pieces of plywood taped in place. I tried this design first by warping the bottom into the shape of the deep V and got the shape I wanted on the model, but felt quite certain that the amount of plywood torture needed would not please many. As is, there is almost no twisting in the panels. If this little design works I would waste no time trying it at 16' x 5' with heavier plywod. By the way, trying thicker plywood on a design with lots of twisted panels can be impossible. Even going from 1/4" plywood to 3/8" about triples the force needed to twist the panel into shape. In my opinion these little boats aren't safe with big motors. I'm suggesting 5 hp. They also do quite well with small motors, say 2 hp. The low powered boat would be faster if the stern were swept up to meet the waterline and didn't drag the stern through the water, but only if the skipper sat well forward so that the boat really trimmed that way. Here is what really happens when someone puts a motor on a good rowing boat - one that has the swept up stern. No one ever puts controls on the boat that allow the skipper to sit forward for proper trim. The boat sits very badly trimmed down by the stern to the point where the skipper can hardly see over the bow. And when the power is applied the situation is a lot worse. So if you plan at all to use a motor, build a power boat like Twang and not a rowing boat. If you plan to never use a motor build a good rowing boat. Oars and motors don't mix well at all. Good rowboats never power well and good power boats never row well. In small boats at least, I know of no successful row/power boat. Remember that arm power might be 1/10 of a horsepower, and the smallest motors are ten or twenty times that. Plans for Twang are still $15 until one is built and tested. Sowsear: Haven't heard anything lately of the Pennsylvania Sowsear.